The night of February 23, 1987 started out like so many other nights. Observers around the globe were carrying out observing programs according to schedule. No one knew then that the signals from the brightest extragalactic supernova in history were about to be recorded on Earth! The first signal came from elusive particles, called neutrinos, detected far below the ground in Japan and the US. Later that night, high in the Andes Mountains of northern Chile, Ian Shelton, a University of Toronto research assistant working at the university's Las Campanas station, began making a three-hour exposure of the Large Magellanic Cloud. (The Large Magellanic Cloud , or LMC, and its companion the Small Magellanic Cloud are the Milky Way's closest galactic neighbors.) When he developed the plate he immediately noticed a bright (about 5th magnitude) star where there should not have been one. Shelton then walked outside the observatory and looked into the night sky where he saw the vibrant light from a star that exploded 166,000 years ago. At about the same time Oscar Duhalde, a telescope operator at Las Campanas Observatory, spotted the supernova visually. A third independent sighting came from amateur observer and AAVSO member, Albert Jones in Nelson, New Zealand. Jones swung his 0.3-meter telescope for a look at the three variable stars he was studying in the LMC. There in the same viewing field was a very bright blue star that did not belong! Jones got his star charts out and noted the position of the new star relative to other stars. Clouds rolled in before he could determine a magnitude estimate so he alerted other observers to his find. Later the clouds broke and Jones was able to estimate a magnitude of 5.1. Not knowing if other observers were clouded out, he continued observing the supernova for another 4 hours. His perseverance provided critical early coverage of Supernova 1987A. That morning the astronomers in Chile sent a telegram announcing the discovery to Brian Marsden at the Harvard-Smithsonian Center for Astrophysics in Cambridge, MA. Marsden is in charge of the International Astronomical Union's Central Bureau for Astronomical Telegrams, a service that keeps astronomers abreast of the latest astronomical discoveries and developments. News of the supernova spread rapidly through the astronomical community by word of mouth and by astronomical telegrams published by the Central Bureau. AAVSO Alert Notice 92 was released on February 25, 1987, alerting observers to the new discovery. Immediately after the supernova was announced, literally every telescope in the southern hemisphere started observing this exciting new object. As the first supernova spotted in 1987, this one was officially designated 1987A. The close proximity and early detection of SN 1987A make it by far the best-studied supernova of all time. A supernova is the explosive end of a star's life. The power of the event is almost more than one can imagine. During the first ten seconds of a supernova core collapse, it radiates as much energy from a central region 20 miles across as all the other stars and galaxies in the rest of the visible universe. In addition to being a spectacular show of power, supernovae are the primary suppliers of heavy elements for the universe. Elements that we find necessary for life, such as Carbon and Oxygen, as well as heavier elements like Iron are produced by nucleosynthesis within the star. In the explosive death of the star, these elements are thrown into the universe where they may be recycled by other stars and gases. The amount of heat and pressure released from a supernova explosion may create new regions of star birth by compressing the surrounding interstellar medium. In addition, supernovae are used as light beacons to measure cosmological distances. Important as they are, few supernovae have been observed nearby. The last one in our galaxy exploded in 1604 and was observed by Johannes Kepler before the invention of the telescope. The rate of supernova discoveries went up immensely with the onset of automatic searches that probe faint magnitudes. A total of 161 supernovae were discovered just last year. Careful study of supernovae provide us with theories and undoubtedly the best candidate for study so far has been the great supernova of 1987. Observationally, supernovae are classified into two main types (type I and II), depending on the presence or absence of hydrogen lines in the maximum light optical spectra of the supernovae. Type I supernovae do not show hydrogen lines and type II do show hydrogen lines. The type I supernovae are further classified into type Ia, type Ib, and type Ic. The spectrum of type Ia supernovae contains Si absorption features, while that of type Ib displays He features but no Si features. Type Ic has very weak or almost no He features and lacks the Si feature seen in type Ia. Type II supernovae (hydrogen lines present) may be further classified into type II-L and type II-P, depending on whether the light curve falls off linearly in time (type II-L) or stays at a plateau for a period of a few weeks before falling off (type II-P). The places of origin of type I and type II supernovae are different. Type I supernovae are found to occur in elliptical galaxies, and in the bulges and halos of spiral galaxies whereas Type II explosions are observed in the spiral arms of galaxies where massive stars are found. The light curves of the two types of supernova also vary (see Figure 1). Type I supernovae are typically two magnitudes brighter than Type II and decay faster. Type II explosions, usually fainter than Type I supernovae, typically show a plateau in their light curves. Theoretically, supernovae are classified according to their explosion mechanism. In broad terms, type Ia supernovae result from the thermonuclear runaway explosion of a white dwarf star to which a critical mass of material has been added. A type II supernova is the gravitational collapse of a stellar core—an event unique to massive stars (this event will be described in more detail below). Type Ib and Ic events are also most likely to be core-collapse events in stars which have lost most of their hydrogen envelope, perhaps through Roch lobe overflow to a binary companion (Sutaria, 2001). 1) Type Ia - Defined by the absence of hydrogen lines and the presence of a Si II absorption line. Typically uniform light curves and spectra. These supernovae are often used to determine cosmological distances. The "Standard Model" is a white dwarf that is incinerated by explosive carbon burning. It is pushed over the critical Chandrasekhar mass (~1.4 Solar Masses) and the density and temperature in the center of the star become high enough to start the burning. 2) Type Ib and Ic - Both lack hydrogen lines and the Si feature. Type Ic display weak He lines. Observations indicate that this type may be due to core collapse rather than explosions in white dwarfs. 3) Type II - Encompasses all supernovae with hydrogen lines. Optical light curves of this type are heterogeneous and subclassifiied into "linear" or "plateau-like" light curves depending on the shape of the curve. Supernova 1987A is classified as a Type II supernova. The stellar onion: Figure 2, The process of burning heavier elements as nuclear fuel repeats until Iron is formed in the core of massive stars (layers are not to scale). Once upon a time, about 11 million years ago, in a galaxy not so far away (the LMC), the progenitor star of supernova 1987a was born, Sanduleak -69° 202 with a mass about 18 times that of our sun. For 10 million years this massive star generated energy by fusing hydrogen to form helium like most other stars. Because of its great mass, the star had to maintain high temperatures and pressures in its core to avoid gravitational collapse. During the hydrogen-burning phase, the central regions of the star contract and become hotter. This ignites helium and marks the beginning of the helium-burning phase. The outer layer of hydrogen expands while the helium burning continues in the core. The star has become a red supergiant and loses some mass through a stellar wind. The core's supply of helium is exhausted in less than a million years, burned to carbon and oxygen. This scenario of core contraction, heating and ignition of a new and heavier nuclear fuel is played out repeatedly. Each burning stage provides less total energy to the system and consequently lasts a shorter period of time. Carbon is the next to burn. Carbon burning, which produces neon and magnesium, lasts around 100,000 years. When the carbon is gone, the core resumes its relentless contraction and heats until the oxygen residue starts to burn producing silicon and sulphur - this stage takes less than 20 years! Then in a week, the silicon turns to iron. The supergiant is now layered like an onion (see Figure 2) as each stage of nuclear burning moves outward in a shell around an iron core of nearly 1.4 solar masses. Iron, the most tightly bound of all atomic nuclei, marks the end of the road for a star since no energy can be gained from its fusion. Now the core is briefly supported by degenerate electrons. The density of the iron nuclei is so high that the electrons start to combine with them to form manganese, and the heat is so strong that extremely energetic gamma rays penetrate them and begin to break them back down into helium nuclei. Now that the electron degeneracy support and gamma-ray energy are gone from the interior, the core contracts faster and faster, then goes into a catastrophic collapse. The iron core flies inward at a quarter the speed of light. When the center of the incipient neutron star exceeds the density of an atomic nucleus the inner 40 percent of the core rebounds as a unit. The outer core, still plunging inward, smashes into the rebounding inner core and rebounds in turn. A shock wave is born. In about a hundredth of a second, it races out through the infalling matter to the edge of the core. Modelers of supernova had then hoped that the shock wave would continue outward through all the layers of the star blowing it apart. However, calculations done by a number of theorists in 1989 (including S. Bludman and E. Myra of U.Penn; S. Bruenn of Florida Atlantic University, E. Baron of the State Univ. of NY at Stony Brook, and R. Mayle and J. Wilson of the Lawrence Livermore National Laboratory) suggest that in SN 1987A the shock did not make it out of the core on its own. 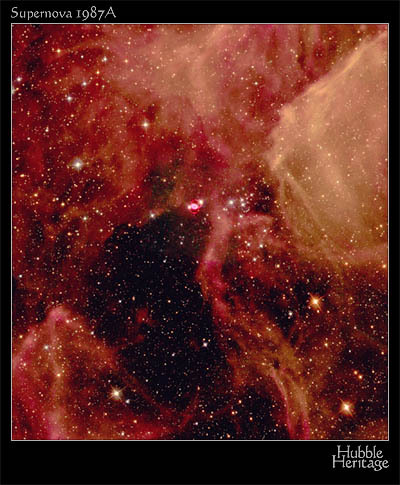 Click on the image for a movie of supernova 1987a. There's an initial flash of light from the supernova explosion causing the ring to glow. Debris hurls into space, the fastest moving at 1/10 the speed of light. The supernova's shockwave causes the ring to glow again. The closer the pieces of the ring are to the shockwave, the sooner they light up. Eventually, the whole ring lights up. Credit: T. Goertel, The Space Telescope Science Institute. Neutrino emission may have provided the power that revived the shock. The core needed to contract even more before it could become a true neutron star. It did so by vast neutrino losses. The neutrinos were produced by the annihilation of electron-positron pairs made by the energetic gamma rays that pervade material at such high temperatures. The total energy emitted in the 10-second neutrino burst was enormous, about 250 times the energy of the material explosion. It is believed that a small fraction of these neutrinos revived the stalled shock and powered the great explosion of the star. By heating and expanding the star and triggering a new flurry of nuclear reactions in its layered interior, the revived shock was responsible for the supernova's optical display. The effect was delayed by about two hours however: the shock had to traverse the entire star before any light leaked out. The neutrinos from the collapsing core easily outraced the shock. Passing through the rest of the star very close to the speed of light, they were the first signal to leave the supernova. After whizzing through space for 166,000 years still hours ahead of the light front, the neutrinos from SN 1987A swept over the earth—and were detected. Lying deep in the Kamioka zinc mine in Japan and in the Morton salt mine under Lake Erie are two massive pools of dark water designed to detect flashes of light from decaying protons. At 7 h 35 m 35 s on February 23, two hours before optical light was detected on earth, the walls of the Kamioka detector registered that 12 neutrinos had smashed into the detector's water pool and that they had penetrated the Earth from the direction of the LMC; six seconds later, 8 more hit the Morton mine. Neutrinos are elusive particles of very small (possibly zero) mass and very high energy, which are produced in huge quantities in the supernova explosion of a massive star. The chance that a neutrino will interact with an atom is so incredibly small that to detect 10 or 20 of them means that there must have been about 10 billion neutrinos passing through every square centimeter of Earth (and of you). The detectors must have caught the exact moment of the collapse of the core even before we saw the light confirm the event! This was a significant triumph for science, indeed. There was a surprise yet to discover about SN 1987A. Everyone expected that the exploding star would be a red supergiant. No one anticipated that the first nearby supernova in years would be an everyday B3 supergiant with a relatively modest mass. 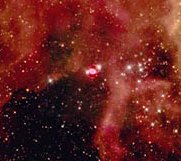 For a time astronomers thought that Sk -69° 202 might be just a foreground star, and that a red supergiant lurked behind it. But the two-hour delay between neutrino detection and the optical outburst was consistent with the relatively small radius appropriate to a B star. An explanation for the unexpectedly small size of the progenitor star may be found in the LMC. The LMC has a lower abundance of heavy elements including oxygen. If Sanduleak -69° 202 had a low amount of oxygen then the star's envelope would be more transparent to radiation thus making it more likely to contract to a smaller size. The star could have been a red supergiant that experienced contraction until it became a blue supergiant of smaller size and exploded (Weaver, 1989). The light curve of the supernova is not typical for a Type II supernova. Instead of coming quickly to a peak and then decaying, the star first dropped in brightness and then leisurely took nearly three months to reach maximum. Toward the end of March, 1987 (a month after the explosion), all of the energy deposited by the shock had already been used to propel ejecta or escaped as radiation. Yet the supernova was still brightening at visible wavelengths until it peaked on May 20, 1987, 80 days after the explosion, to magnitude 2.9. Observations indicate that by April, another source of energy was providing most of the light: the decay of radioactive isotopes produced in the explosion. An especially important nucleus that formed deep inside the star, just outside the collapsing core, is nickel-56. The theory is that nickel-56 decays into cobalt-56 with a seven-day half-life, then the cobalt nuclei decay into iron-56 with a 111-day half-life, which is stable. So instead of fading from view in a few months, SN 1987A was steadily energized by the decay of fresh radioactive nickel. The light curve tracked the cobalt-56 radioactive decay rate, as one would expect from a system with that as its energy source. Ground-based images of SN1987A were only able to show a tiny unresolved blob of gas, so it was with anticipation that astronomers awaited the results from the Hubble Space Telescope, launched in April 1990. The first images of SN 1987A taken with the ESA Faint Object Camera on HST on August 23-24, 1990, resolved the inner circumstellar ring of the supernova. Nino Panagia of the Space Telescope Science Institute compared the ring's angular size to the time delay between the supernova flash and the ring's strongest emission. In this way he was able to make a direct geometric measurement of the distance to the supernova (and thus the LMC). The distance found this way is 166,000 ly with an uncertainty of 6 % (Kirshner, 1997). This independent distance determination to the LMC provided an exciting new check on determining cosmological distances. Right now, the high-velocity material emerging from the supernova explosion is overtaking the slower-moving surrounding rings. Recent Hubble images provide a close picture of this phenomenon. In less than a decade, the full force of the supernova's fast material will hit the inner ring, heating and exciting the gas, which will produce some new cosmic fireworks. The main effect will be that the remnant will become very bright in radio wavelengths. We should enjoy the show right now because by the next century, the material in the rings will disappear and merge into the general interstellar medium of the LMC. For an animation of brightening knots in the ring around SN 1987A, visit this STSci web page. AAVSO Alert Notice 92, "A Very Bright Supernova in the Large Magellanic Cloud (LMC)", February 25, 1987. Genet, Russel. Supernova 1987A: Astronomy's Explosive Enigma, Fairborn Press, 1987. Kirshner, Robert P., "Supernova 1987A: The First Ten Years", Sky and Telescope, February, 1997. Leibundgut, B., "Observations of Supernovae", European Southern Observatory Scientific Preprint no. 973, January, 1994. Petschek, Albert. Supernovae, New York, 1990. Sutaria, Firoza. "Supernovae - Observation and Theory", Khagol, A quarterly bulletin of the IUCAA, January, 2001. Weaver, T., Woosley, S., "The Great Supernova of 1987", Stars and Galaxies: Citizens of the Universe, Readings from Scientific American Magazine, pp. 145-157, August, 1989.